According to Accenture, a little over a third of a rep’s week goes to selling time, while 20% goes to account management processes such as data entry into CRM. Meetings (17.3%), research (15.3%) and other miscellaneous activities like training and travel (12%) also take up a chunk of sales rep time. Even more staggering, a more recent Sirius Decisions report found that while sales reps spend 30% of their time prospecting, they only spend 18% of their time actually interacting with buyers! Sales reps aren’t spending enough time selling. Why is this important? Because selling time is the number one factor in increasing revenue. Every hour your sales reps don’t spend selling equals lost potential revenue. According to Hubspot, sales reps spend an average of 5.5 hours a week just entering contacts and activities into CRM. More important than the time spent actually entering all of that data is the break in concentration that occurs each time a sales rep has to stop selling in order to record CRM data. Sales enablement technology circumnavigates the problem completely by automatically capturing the data that needs to be entered into CRM. 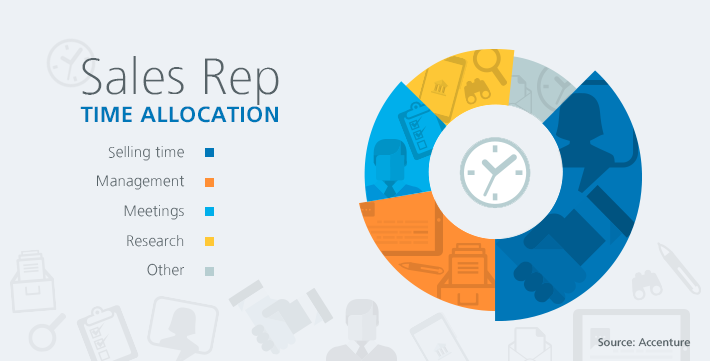 Your sales reps go about their day, doing normal selling activities like making phone calls or sending emails, and all of the relevant data is updated in CRM automatically. Cut down on that big chunk of meeting time by integrating real-time coaching directly into the selling process. Within a sales enablement platform, sales reps can get automatic coaching tips on next steps to move deals forward, such as relevant content to send to the buyer, Subject Matter Experts to consult with, optimal times to contact prospects, accounts to prioritize first and much more. This automated coaching and guidance happens seamlessly during the sales process. As a bonus, sales manager time is also optimized. The complete tracking of buyer and seller activity, combined with clear visualization of data, allows sales managers and coaches to tell at a glance which sales reps are performing well and which reps need guidance in specific areas. Finding and personalizing sales resources is another sales rep time waster that can be solved with sales enablement tools. Instead of having your reps search through network drives, SharePoint, email inboxes and more just to find a specific sales presentation, give them one centralized, cloud-accessible library with a robust search engine. Next, use integrated customization wizards to walk your sales reps through a quick and easy process to create buyer-specific presentations in minutes. These high impact presentations are a key differentiator for buyers, and customization wizards have built-in branding and style controls to maintain the same high quality your reps would get if they waited hours for marketing to create presentations for them. Are you capitalizing on the time your reps are spending traveling? Those hours spent waiting at the airport or sitting on the subway don’t have to be wasted. Equip your reps with a mobile selling solution that allows them to access sales resources, buyer information, pipeline activity and more—straight from their phone or tablet. Beyond increasing productivity, mobile-friendly selling allows your sales reps to jump on opportunities they might have otherwise missed. Imagine a scenario in which a rep is on her way to a presentation. She gets a call from her buyer asking if they can also cover another topic during the meeting. Because the rep can customize presentations from her phone, she’s ready with the revised materials before she reaches her destination. How do your sales reps research new leads? Go to their company website? Visit their LinkedIn page? Peruse their tweets? Do a Google search? Think about how much time that takes per prospect, then consider how many new prospects your reps reach out to every day. Your sales reps could do all of this in a manual, slow process, or they could use an aggregated market intelligence tool like InsideView directly within their sales enablement platform. With a single click, your reps get access to all of their prospects’ relevant information, such as company details or industry news, significantly cutting down on research time while improving their knowledge going into sales calls. 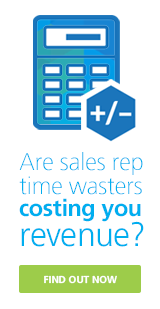 What would increasing sales rep productivity mean for company revenue? It’s a complex answer that differs for every company, so instead of spitting out an arbitrary number, here’s a better suggestion: try this selling time calculator. You can put in the numbers that are meaningful for your company (number of sales reps, average annual quota, etc.) and then identify how much money and time you would get back annually by increasing selling time. Low productivity may be the expected norm for sales teams, but it doesn’t have to be the standard for your business. Get ahead of your competitors by implementing these sales enablement tools, then watch as your sales reps soar past their quotas.